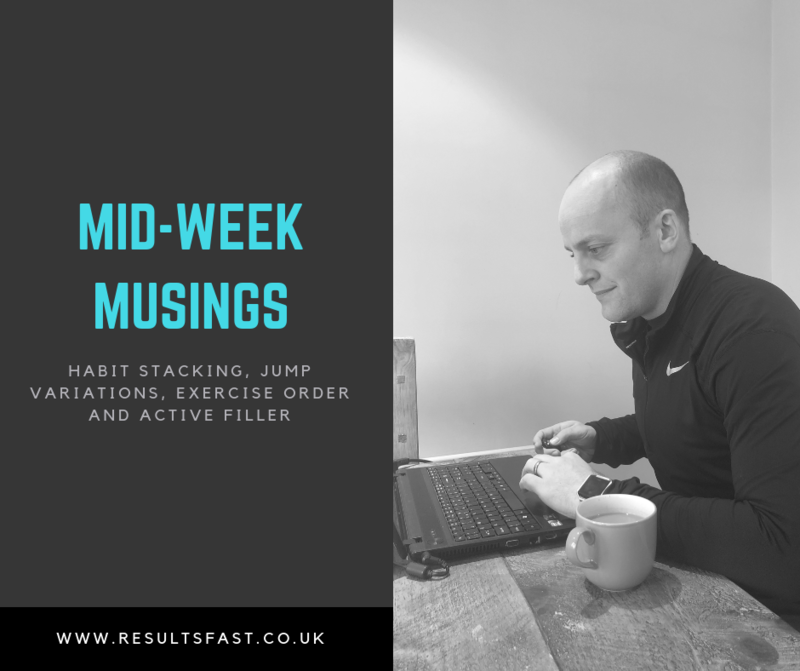 Mid-Week Musings: Habit Stacking, Jump Variations, Exercise Order and Active Filler. As the start of a new series of blog posts I am going to clear up questions I have been asked while coaching the previous week. By the nature of personal training people for a variety of goals from fat loss to athletic performance it highlights the wide range of questions that we get week to week. Sooooo, of we go…. The concept of habit stacking has been proposed in the book Atomic Habits By James Clear. This concept involves layering new habits on top of old habits to help build new behaviours by providing minimal disruption. Undertaking new habits can be really challenging as habitual behaviour is fundamentally hard to change. This sits alongside our concept at Results FAST of focussing upon positive change by not denigrating behaviours that you consider as unideal but instead focussing upon adding new behaviours in a positive sense to foster change. A good example of this is increasing your vegetable intake by always having a green salad with your dinner. Dinner is the habitual behaviour and the green salad can sit alongside dinner easily to achieve positive change. When it comes to exercise adherence and exercising regularly this could be achieved by getting changed in to your exercise clothes before leaving work. When you consider all the things you do daily how could you layer positive behaviours on top of your current behaviours making positive habit change easier. A good example of this is that when people keep a food diary their food intake starts to tidy up. How often also does a healthy eating plan seem to follow regular exercise? Habit change can be about creating a bit of momentum and therefore layering new behaviours on top of others may help you achieve more. Box Jump Variations For Strength and Conditioning. Box jumps basically in my mind among the most poorly programmed exercise alongside burpees. Jumps by nature need to be quick as they are primarily a power exercise therefore if they are going to be maximal they need a lot of recovery to be performed well. Simply if jumping on a box is used with minimal rest or supersetted with other demanding exercises it’s a great way to train poor jumping mechanics. There are a whole host of better and safer ways to train lower body endurance if power isn’t the target. Jumping on a box often looks cool and is often part of Crossfit style repetition style workouts- what often looks impressive isn’t always so when there are better ways of working when a good coach can understand exercise choice and ordering. Exercise Order and Session Pacing. Programme design and getting exercises in the right order to me are the whole reason you hire a personal trainer. What matters is that after your warm up/ preparation the first exercise or block of exercises you perform should be the most neuromuscularly demanding part of your session. Read that as the most powerful/ heaviest/ explosive. It doesn’t make sense to pace a session and go lighter at the start of training as you will be leaving results on the table (maybe if you are easing yourself back in to a routine but not if you have been training regularly). If the hardest part of your training is near the end of your workout you haven’t worked hard enough at the start of the session. Active filler is how we get our training clients to recover between exercises keeping them fresh enough to perform their primary exercise while not feeling as if they are doing nothing in sessions if they need the rest. Good examples of active filler may be mobility work such as three point rotations or calf stretches and low level core drills which may be tough but not ultimately fatiguing such as planks, side planks and deadbugs. In some exercisers who may be chronically tight or have a weaker core they may provide a level of cardiovascular work but after about 6 weeks of regular training it allows you to concentrate more on the primary exercise. Good examples may be pairing a deadlift with a calf stretch, Bench Press with some hip mobility work and single leg work such as lunges with a side plank.